The View on High is a luxury student housing, which has an excellent location in Ohio. Surrounded by cinema, stadium, shopping mall, and more, you will definitely love your life in The View on High. 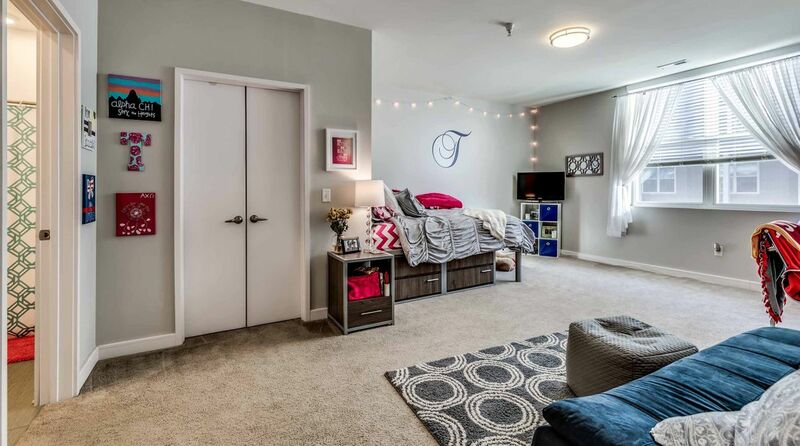 Located directly across the street from The Ohio State University, it's just steps away from classes, libraries and the Ohio Stadium. 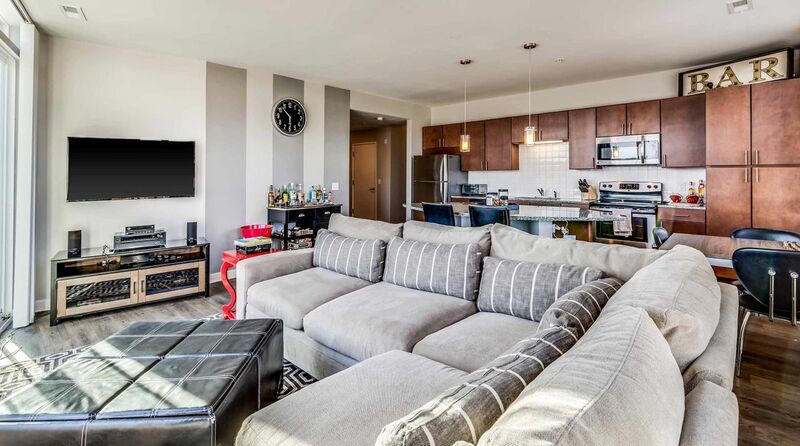 The View on High offers furnished apartments with a 50" flat screen TV in a variety of floor plans, with wireless and wired high-speed internet included. 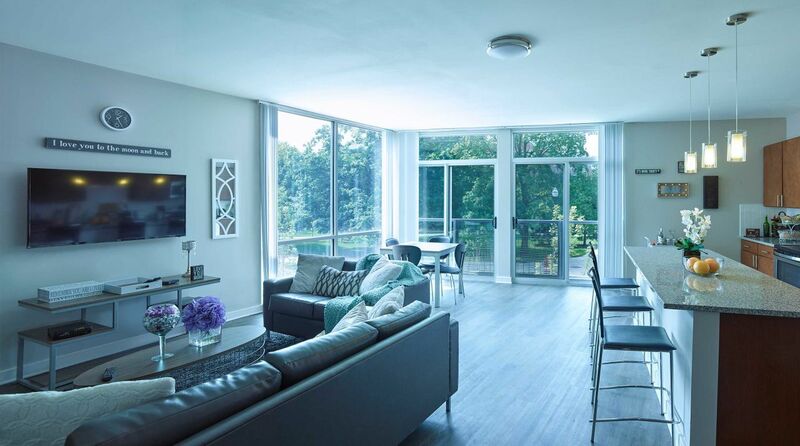 One- two- three- four- and five-bedroom units are available, some with wrap-around balconies. Most bedrooms have attached baths. Each living room is furnished with modern, comfortable sofas, chairs and occasional tables, and each has plenty of space for get-togethers. There’s a flat screen television, too, so watching games, your favorite reality shows, or firing up Netflix is always a pleasure. Each apartment’s kitchen features beautifully equipped, efficient work spaces. Whether you’re already a great cook, or are at your best heating gourmet frozen foods in the microwave, you’ll appreciate the high-quality appliances, granite countertops, and modern wood cabinetry. Built-in islands or free-standing kitchen tables provide eat-in space, too. A central, second-floor courtyard features fire pits, grills, dining areas, and plenty of comfortable seating. It’s a great space for hanging out with friends, sunny-day studying, or grabbing a quick nap. Large glass doors lead from the courtyard to indoor common areas. Here, enjoy the lounge equipped with video games, flat-screen TVs, and more inviting seating areas. So you will have a dynamic, luxurious setting where you can live, learn and thrive at The View on High. Wir haben leider keine Unterkunft gefunden, die deinen Wünschen entspricht.Alle Privatzimmer in The View on High ansehen. Wir haben leider keine Unterkunft gefunden, die deinen Wünschen entspricht.Alle Ganze Wohnung in The View on High ansehen.